Two detachable stubs for employer and employee records. 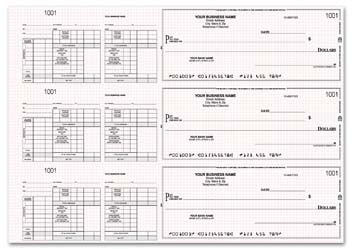 If your company has employees who want to keep a close eye on their paychecks and an accounting department that does the same with your business finances - these 3-per-page manual checks are ideal for payroll purposes. Double Stub Payroll Checks conveniently feature two detachable payroll stubs - one for the employer and one for the employee. There is space for all the typical deductions including state and federal taxes as well as social security and Medicare. This selection works for both hourly and salaried workers. Just remove the employer section before sending out paychecks to staff and keep it for company records. Add a 7-Ring Binder to help keep your new business checks in order. 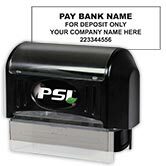 Plus, our Check Stub Storage Box is the perfect way to keep all those little stubs from getting disorganized. Get the Double Stub Payroll Checks today and keep everyone happy!